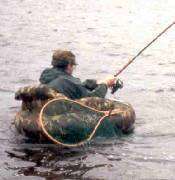 An angler in a float tube plays a pike. Offshore boat fishing, sometimes called deep sea or open water fishing, is fishing in deep water (more than 30 metres) and at some distance from land. 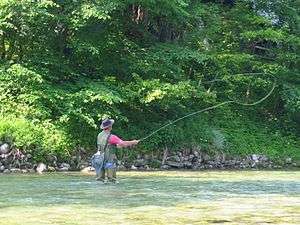 It is dangerous compared to shallow water or lake fishing. More knowledge is needed about weather patterns, navigation and safety precautions, and this is not an activity for beginners. Offshore boats are generally much larger than inshore boats, and may need to be moored in a marina. 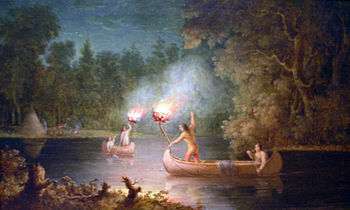 They are sturdily constructed so they can brave the weather and water conditions encountered in open waters. Though they differ in design and purpose and prices vary widely they are generally expensive to build and maintain. 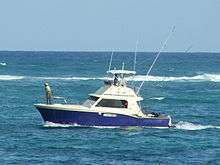 Most offshore recreational fishermen charter boats rather than own them. It is often a pastime of the affluent, and there is a demand for charter boats equipped and catered to luxurious excess. Offshore game fish, like marlin and tuna, can be very large and heavy tackle is needed. Fishing is usually done with sea rods, such as downtide rods, with lines of 30 to 50 pounds and multiplier reels. Baits are the same as for inshore fishing and include squid and whole mackerel as well as artificial lures such as perks. Fishing takes place over reefs and wrecks for very large cod, ling and congers.